These Joiner Elbows are pre-assembled and ready for use. Simply insert your chosen pipe into Joiner Elbow and tighten the nut. 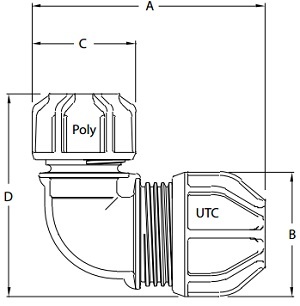 UTC ends contain hard stainless steel gripping teeth which provide superior end load resistance. Nuts can be tightened with a wrench. Suitable for use with PVC, ABS, Copper, Stainless Steel, Galvanised Iron, Lead and Polyethylene pipe.